Investing in one of these companies will make your portfolio grow stronger. U.S. residents seem to be getting more optimistic, as the consumer confidence index rose to 78.1 in December from 72.0 in the previous month . Consumers have started opening their wallets, spending more during the holiday season than in the previous months. In fact, consumer spending reached a high of $96 per day for the month of December, much higher than the $84 in September . Retailers have obvious reasons for merriment. Branded consumer foods should benefit from this uptick in spending. Some of the prominent players in this industry are General Mills (NYSE:GIS), Kellogg (NYSE:K), and J.M. Smucker (NYSE:SJM). Each of these companies has been trying its best to attract customers and expand its top line. J.M. Smucker provided the highest return of 118.9%, as the company has been benefiting from its expanded product portfolio. Its dependence on coffee, which makes 39% of its total revenue, has been quite advantageous. The growing popularity of K-Cups, Smucker's acquisition of the Folgers coffee brand, and an increase in coffee prices has helped the food company grow its sales. In fact, sales of K-Cups increased 9% in the retailer's most recent quarter. Additionally, Smucker's Jif peanut butter strengthened its U.S. retail consumer foods segment. Continuous promotions and new product introductions have benefited Smucker's volumes in this segment as well . General Mills has provided a return of 61.5% to its investors, helped by an increase in sales over the period. Its acquisitions of Yoplait and Yoki Alimentos SA in 2012 helped its growth. General Mills' Greek yogurts for health conscious people lured large number of customers, driving sales higher. The company always brings in new products which attract more customers. Kellogg's stock price has appreciated the least, mainly because of its dependence on cereals. Since a number of new healthy breakfast options are being introduced such as Greek yogurts and smoothies, people have shifted their preference from cereals. However, Kellogg has been trying to win back customers by introducing new varieties and flavors. It also plans to launch new breakfast options which will compete with sandwiches and smoothies. J.M. Smucker looks even more attractive with its recent acquisition of Enray, a provider of premium and organic grain products, in August 2013. This will help the company expand its existing natural foods business. Moreover, it will add around $45 million to its top line on an annual basis. Smucker's future looks bright as a result of this move since natural and organic foods are in vogue . General Mills recently introduced Nibblr, a snack service which delivers food to the subscriber's home or office on a regular basis. The package contains four kinds of snacks which are of less than 150 calories each. This new concept should enable the company to land customers in hordes . Kellogg has launched a new breakfast drink which will enable customers to have cereals in a new way. It plans to control its costs and expand its margins by cutting down its workforce by 7%. It is difficult to say how Kellogg will benefit from such moves, however. When looking at the three players, both J.M. 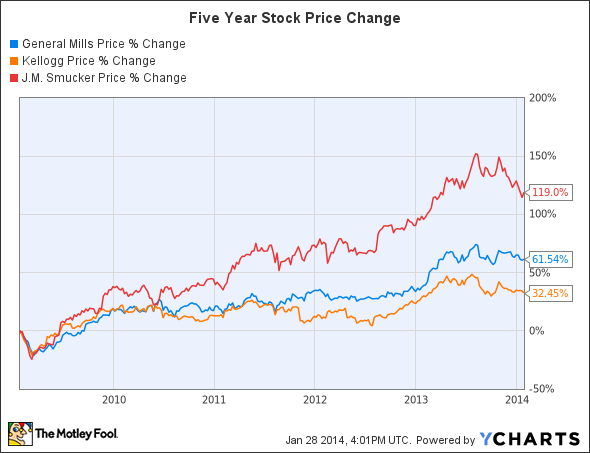 Smucker and General Mills are doing well but Kellogg has been a laggard. In fact, Smucker has been a great player, making the most of its acquisition strategy. Its recent acquisitions should positively enhance its product portfolio. General Mills' future looks bright as well, especially with its new Nibblr concept hitting the market. Investing in either of these two companies should be rewarding.